"I developed this recipe after visiting my ancestral homeland of Ireland. 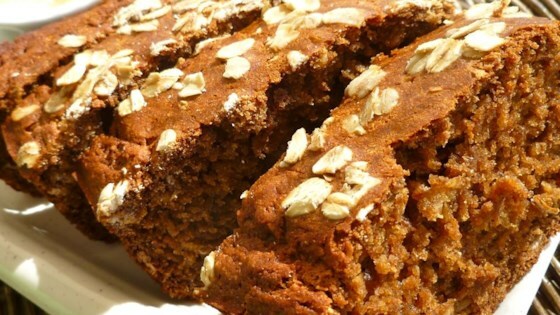 It's a great way to get Guinness into your bread! Serve warm with butter and honey." Preheat oven to 425 degrees F (220 degrees C). Grease an 8x8 inch baking pan. Mix together the oats, flour, sugar, baking soda, baking powder, and salt in a bowl. In a separate large bowl, stir together the butter, vanilla, buttermilk, and Guinness(R) beer. Pour the flour mixture into the beer mixture, and gently stir until well blended. Pour batter into the prepared baking pan, and sprinkle with additional oats if desired. So dense and good! I made this to go with Beer Cheese Soup V (from this site) and beer margaritas -- it was a great dinner!